It is a New Year and a Siberian cold front is sweeping across Europe, coming to the UK with a vengeance, bringing a bitter cold with it along with thick snow and ice on the roads. A fleet of trucks will spread grit across the roads and motorways, but that is no excuse for drivers to not be vigilant and prepared for the treacherous weather ahead, as even the gritters won't catch it all. More road accidents and fatalities occur during these dark and cold winter months, so it is essential that you familiarise yourself with the truths and myths of driving in the winter. This means that now is most certainly the time to be extra cautious to possible hazardous conditions when on the roads and motorways. 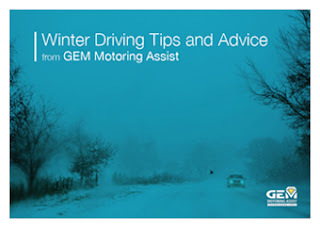 GEM Motoring Assist (www.motoringassist.com) has created a free downloadable guide that is an advice manual for driving during the winter months. Amongst the many things the manual will include it will also contain important advice in the event of a breakdown, tips for when driving in the snow and a handy travel checklist. Driving safely in the ice & snow, fog and hail. How to maintain your car during the cold winter months. What to keep in mind when driving abroad, especially in ski locations. The safest techniques for dealing with hazards such as black ice and aquaplaning. The downloadable guide will also take the time to debunk a number of the myths associated with driving in winter conditions, making it a valuable resource for every motorist. GEM is completely committed to providing the highest quality of information and advice for every motorist. GEM celebrated its 80th Anniversary in 2012, and has an excellent reputation for being a trusted source of information and support for its many members. It also has a long and successful history of campaigning for improvements to road safety legislation and is responsible for supporting a number of the major reforms in road safety, making it one of the top campaigners in their field.